Why Should We Make Peace With Food? It’s my job to help people normalise their relationship with food. I’m a psychotherapist who works exclusively with people who overeat. 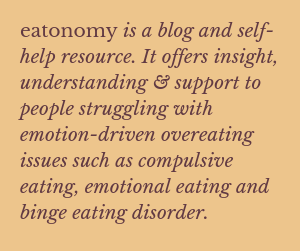 I use the term “emotion-driven overeating” to encompass the overeating spectrum that includes compulsive eating, emotional eating and binge eating disorder. But why is it important to have a “normal” relationship with food? After all, some would argue that most people have a dysfunctional relationship with food, that there is no “normal”. So what’s the big deal? Beating yourself up as you feel sick from all the food you’ve rammed into your body and then wondering how to dispose of the “evidence”. Being caught in an overeating cycle is a miserable existence. I know this from my own experience. Waking up every day feeling desperate about what you “can” and “can’t” eat. Labelling foods as “good” or “bad” and yourself likewise depending on what choices you make. Attempting to restrict certain foods in an effort to lose weight and then bingeing on them alone, in secret, shamefully, at high speed. Beating yourself up as you feel sick from all the food you’ve rammed into your body and then wondering how to dispose of the “evidence” before anyone finds out. Vowing you’ll never do it again, only to find yourself at the local shop a few days later, or even the next day, surreptitiously selecting binge food and hoping the cashier won’t give you a judgemental glance when you take your substantial haul up to the checkout. Round and round it goes as, inevitably, you gain a considerable amount of weight and hate your body and yourself with a passion. Part of healing your relationship with food is the simple but not easy process of getting in touch with your body’s hunger, working out exactly what you feel like eating and paying attention so you know when you’re satisfied. Disempowering phrases like “I’m trying to be good”, “how many calories are in that?” and “I shouldn’t, I’m meant to be on a diet”, are gradually replaced with autonomous questions such as “am I hungry?”, “what do I feel like eating?” and “have I had enough?” as you learn to listen to your body and honour your preferences, whatever they might be. You delay the day when you start living the life you want until you’re “thin enough” to deserve it. When my clients begin to work through their issues and normalise their relationship with food, what they seem to appreciate most is the sheer freedom from the stress around eating. Any reduction in size because they’re eating exactly what satisfies them and are working with their metabolism is simply an added bonus. The real joy is feeling OK around food because they know they can have exactly what they feel like. Gone is the agonised internal debate about what they’re “allowed” to eat. No longer are they “ohmygodohmygodohmygodchocolatebiscuits”. They’re just chocolate biscuits and they’ll have one if they feel like it. Food becomes a pleasure, something to be enjoyed and savoured. Perhaps the worst part of having overeating issues is never really engaging with life because so much of your energy is directed towards your full-time preoccupation with food. In addition, the shame you feel around your eating and your body means you perpetually delay the day when you start living the life you want until you’re “thin enough” to deserve it. These are just some of the reasons why I feel it’s important to heal our relationship with food. But perhaps the most important is so that we don’t condemn generation after generation to the same food misery and body loathing. For me, that’s reason enough. For ideas on normalising your eating, here are 10 principles of intuitive eating. Next ›Why Does Being Mean to Yourself Matter?